Summary of President Warren Harding for Kids: "President Hardly"
Summary: Warren Harding (1865-1923), nicknamed the "President Hardly" or "Winnie", was the 29th American President and served in office from 1921-1923. The Presidency of Warren Harding spanned the period in United States history that encompasses the events of the WW1 & Prohibition era. President Warren Harding represented the Republican political party which influenced the domestic and foreign policies of his presidency including the policy of Isolationism. The major accomplishments and the famous, main events that occurred during the time that Warren Harding was president included the 1922 agreement to limit naval armaments signed by the US, France, Great Britain, Japan, and Italy. The Mellon Plan, a package of economic legislation, was introduced and the 1921 Emergency Quota Act used a percentage system to restrict immigration. The close friends favored by President Warren Harding, referred to as the "Ohio Gang", were involved in bribery and corruption. The Teapot Dome Scandal (1921-1923), involved national security, oil companies and corruption but the president died before he was implicated in the scandal. Warren Harding died of a stroke on August 2, 1923, aged 57. The next president was Calvin Coolidge. The summary and fact file of Warren Harding provides bitesize facts about his life. The nickname of President Warren Harding provides an insight into how the man was viewed by the American public during his presidency. The meaning of the derogatory nickname "President Hardly" refers to his lack of decisiveness and his inability to make hardly any important or controversial decisions during his presidency. The character traits of President Warren Harding can be described as quiet, generous, humble and kind. Warren Harding had quite a low self-esteem and sought the good opinions and praise from people which led to his difficulty in making contentious decisions. It has been speculated that the Myers-Briggs personality type for Warren Harding is an ISFP (Introversion, Sensing, Feeling, Perception). A quiet, easygoing character with a a "live and let live" approach to life. A perfectionist, loyal to values and beliefs. 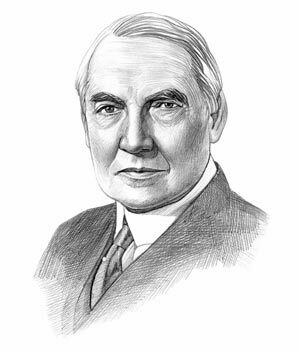 Warren Harding Personality type: Practical, action-oriented and considerate. Summary of Isolationism in the 1920's: The foreign policy of Isolationism in the 1920's was adopted by Warren Harding that aimed at self-advancement to make the United States economically self-reliant whilst retaining peace with other nations. The American foreign policy of Isolationism was also adopted by the Republican governments during the administrations of President Coolidge. The foreign policy of Isolationism was an attempt to isolate the US from the diplomatic affairs of other countries by avoiding foreign entanglements, entering into alliances, and limiting foreign competition by imposing high import tariffs. Summary of the Mellon Plan: Andrew Mellon was a highly successful banker who was first appointed the United States Secretary of the Treasury by President Harding. He devised the Mellon Plan, a package of economic legislation, which reduced taxes on the wealthy and the corporations in America that encouraged growth and led to the boom in stock market investments. As part of the Melon Plan the Bureau of the Budget was established in 1921 as a part of the Department of the Treasury by the Budget and Accounting Act of 1921. Summary of the Washington Conference : The Washington Conference was an international disarmament meeting called by President Warren Harding that took place from November 1921 - February 1922. The Washington Conference was hailed as a great success and led to three major treaties - the Four-Power Treaty, Five-Power Treaty and the Nine-Power Treaty. Summary of the Tomb of the Unknown Soldier: The Tomb of the Unknown Soldier was dedicated on November 11, 1921 as a monument to all those who had fallen during the Great War. In 1921 the body of an unidentified World War 1 soldier was exhumed from a World War I American cemetery in France and buried in Tomb of the Unknown Soldier at Arlington National Cemetery. Summary of the 1921 Emergency Quota Act: The 1921 Emergency Quota Act used a percentage system to restrict immigration. Summary of the Ohio Gang: The Ohio Gang was a group of close friends favored by President Warren Harding who were exposed for being involved in financial and political scandals relating to bribery and corruption. Members of the Ohio Gang abused their positions of power. By 1923, rumors of corruption in President Warren Harding's administration and the Ohio Gang had begun to surface he began to distance himself from his old cronies. Summary of the Teapot Dome Scandal: The Teapot Dome Scandal involved prominent members of the Ohio Gang, cabinet member Albert B. Fall, Secretary of the Interior and Edwin C. Denby, Secretary of the Navy, in relation to national security, oil companies and corruption. Albert Fall and Edwin Denby received "loans" (bribes) to lease land in Teapot Dome and Elk Hills to oil companies. President Warren Harding died unexpectedly of a heart attack on August 2, 1923. His reputation ruined by the activities of the Ohio Gang. The article on the accomplishments of Warren Harding provides an overview and summary of some of the most important events during his presidency. The following Warren Harding video will give you facts about the events of his administration.